OTR tire is off-the-road tire, of which the size is 12.00R24 or above. Hot retreading. It is suitable for retreading OTR tires running on the road of bad condition. Cold retreading. It is suitable for retreading OTR tires running on the road of better condition. 1. Rich experience and excellent technique with over 30 years retreading experience. China's largest tyre retreading equipment manufacturer. 2. High specialization. 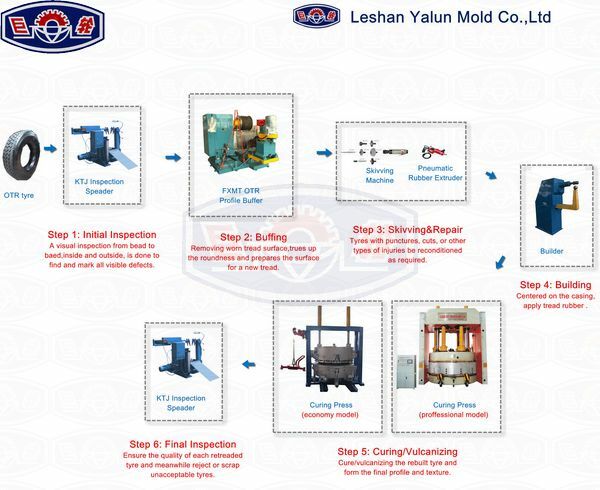 Yalun is specializing in manufacturing tyre retreading equipments which offers full-range service, covering plant planning, consultation, technique support and after-sales service. 4. High quality, and cost-effective. The initial inspection is to inspect the casing from inside to outside to evaluate the acceptability of the tire and decide whether the tire can be retreaded or not. Buffing is to remove the old, worn OTR tread surface, true up the roundness to prepare the surface for a new tread or pre-cured tread. It involves the FXMT Buffer. Put the tire on the FXMT Buffer, and rotate the tire with the grinding buffing the tread to the pre-set width, surface and arc. Skiving is to buff the tread in the certain degree allowed and repair the small hole. Equipments involved: skiving machine and pneumatic rubber extruder. Building is to apply cushion gum and tread to build the pre-cured tread for the buffed and prepared casing. Repeatedly rolling and compacting the built casing by pressure roller, to effectively exhaust air between pre-cured tread and casing, and then make them bonded more firmly. It is used to encase the uncured, built tire in an elastic envelop in preparation for curing. Curing is to bond the casing and the tread tightly under specified heat, pressure and a period of time in the autoclave. It is to inspect all the retreaded tires carefully to make sure good quality. 1. Rich experience and excellent technique with over 30 years retreading experience. China’s largest tire retreading equipment manufacturer. 3. Customization. 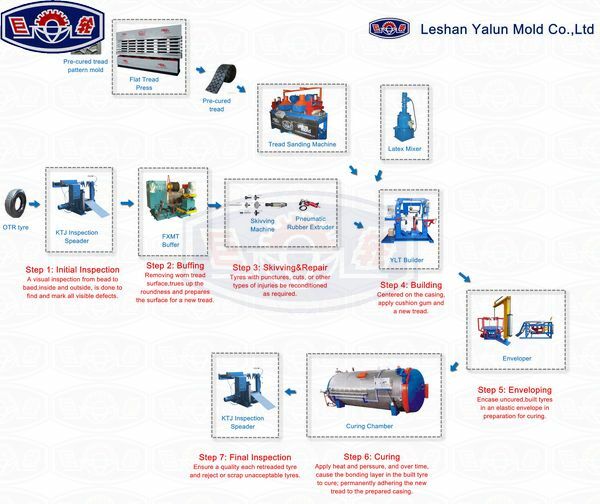 Yalun can customize equipments on clients’ requirements and design reasonable retreading method. The initial inspection is to inspect the casing from inside to outside to evaluate the acceptability of the tyre and decide whether the tire can be retreaded. Buffing is to remove the old, worn OTR tread surface, true up the roundness to prepare the surface for a new tread or pre-cured tread. It applies the FXMT Buffer. Put the tire on the FXMT Buffer, and rotate the tire with the grinding buffing the tread to the pre-set width, surface and arc. Vulcanization is the procedure that bonds the new casing and tread tightly. During the vulcanization the uncured rubber becomes tough and durable tread gradually. Put the prepared casing into the segment press, when the mold close and up to the certain pressure, the casing will be pressed on the mold with set pattern. Then over a period of time, the mold with pattern will be vulcanized.